Yarrow blossoms. Each flower is about 5mm (1/4") wide or even smaller. Yarrow (Achillea millefolium L.) is one of those wildflowers that is sort of easy to miss. It’s not that we don’t see it, it’s just that—for most people—it’s not very pretty. Or at least not as pretty as many of the other more showy wildflowers we have in Nova Scotia. be the case. These specimens are about 12" (30 cm) high. Yarrow is an herb that grows between 1-3’ high. The flower heads are flat inflorescence (bunches) of small, five petalled white blooms that have a strong odour reminiscent of sage. 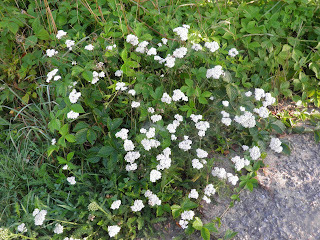 The flowers occur from July through October. If you’re lucky you will also stumble upon the pink variety. The plant is identical except the blooms are ever so slightly tinged delicate pink. From what I have read this is not native but is a European introduction. I always thought it was just a variation of the same flower. Non-native ornamental yarrows (for gardens) can be purchased at most garden centres, available in colours from very bright red to even lilac. I believe I may have even seen an orange one once. The flat heads of yarrow are sort of reminiscent of lace, but not nearly as open and delicate as Queen Anne’s Lace. Yarow flower heads are quite dense although small. The sturdy stems are covered with fine wooly hairs as are the feathery leaves. Both are a grayish-green colour. Although leaves appear on the stems, the majority of them are at ground level. This perennial reproduces via seed and by rhizomes. The deep, creeping roots actually make the plant quite drought tolerant. 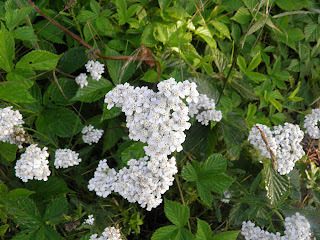 You can find yarrow growing in quite a few different places, such as ditches, pastures, shorelines ad woodlands. One requirement for it to do well is acidic soil. It also likes dry rocky soil, which accounts for it being seen in disturbed areas. Yarrow can found in most provinces of Canada, including the Yukon and North West Territories. Yarrow is best known for its medicinal qualities. Its volatile oils are antibacterial, anti-inflammatory and diuretic, and its tannins are astringent. The alkaloids present are both hypotensive and hypoglycemic. 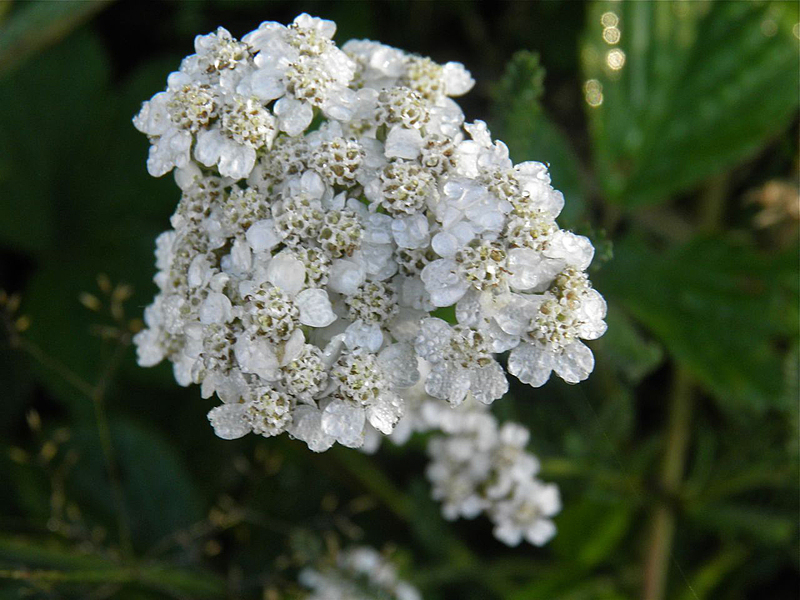 Yarrow even has coumarin, which helps reduce high blood pressure. The bitterness, when tasted, denotes the presence of flavonoids and alkaloids. These compounds have effects on the digestive system, tissues and the blood stream. Native Canadians used yarrow to treat headaches, stings, cuts, sores, burns, and nosebleeds. Today, extracts from the plant can be found in many pharmaceuticals. Application varies from cramps, nausea, and inflammation to fevers, colds and aromatherapy uses. Here are a couple other uses for yarrow. The leaves and flowers can be boiled as tea. An early reference cites the tea as useful for “melancholia”. The flowers can also be used as a dye. The colour ranges from yellow through to light olive green. So always remember that what may seem uninteresting or attractive on the surface usually has far more going for it than what meets the eye. Of course, if you're planning to "self medicate" think twice.Although yarrow is a staple on natural medicine always consult with a doctor before adding any medicinals to your diet. There could always be conflicts with medicines you currently take. Sometimes serious conflicts. So be aware, and be safe.